Employers host holiday parties to boost employee morale. Unfortunately, some employees use the party as an excuse to act inappropriately. Sometimes, actionable sexual harassment and other harassment occur at office holiday parties. 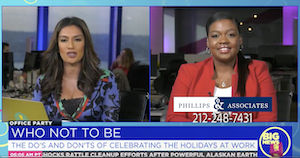 Recently, Marjorie Mesidor, a New York City employment lawyer at Phillips & Associates, appeared on Cheddar TV to discuss the dos and don'ts of celebrating holidays at work and how to report harassment that occurred at a holiday party. A reporter at Cheddar TV asked Ms. Mesidor why office holiday party etiquette is so important. Ms. Mesidor explained that even though alcohol is being served, and there is a party atmosphere, you are still at work when you are at the office holiday party. The reporter remarked that the holiday party at Cheddar Big News and Cheddar was the coming Friday, and they asked what was okay or not okay to say to your boss and what should definitely not be asked at a holiday party. Ms. Mesidor remarked that any version of the game "Who would you marry, sleep with, or kill" could send you to HR. Generally, no employee should say anything that would otherwise make him or her blush in front of people that he or she respects. The reporter also asked what employees should not do at their holiday party this year. Ms. Mesidor explained that you do not want to be the drunkest person in the room at a holiday party. All employees should fight the urge to use the open bar. Employees should avoid being someone who chases people down for kisses under the mistletoe. Employees should also avoid looking like the office exotic dancer by using relatively conservative dance moves and dress styles at the party. The reporter asked what employees should do if they wake up the following morning regretting their actions of the night before. Ms. Mesidor answered that employees should be accountable for their improper conduct at a holiday party. If an employee has said something regrettable to a colleague or supervisor, they should express regret and own up to the behavior. The reporter asked what an employee should do if she or he feels that a coworker got out of control. Ms. Mesidor explained that in the moment, an employee who feels unsafe should get to a safe space. The employee should also object in some way and let the perpetrator of the misbehavior know that it is unwelcome. The employee should also document the behavior by texting it to themselves or to a family member or friend. The employee must speak to a supervisor or HR and let the supervisor or HR know that she or he was caught in an uncomfortable circumstance at the office party. It can be important for the employee to contact an attorney to find out what his or her rights are. Federal, state, and local laws prohibit sexual harassment at an office holiday party. However, there are significant differences among these laws, and it can be important to talk to a skillful and knowledgeable attorney about which law would provide you with an appropriate remedy. Federal Title VII of the Civil Rights Act of 1964 only applies to employers that have at least 15 employees. The New York State Human Rights Law applies to employers of all sizes, but you cannot recover punitive damages under the state law. The New York City Human Rights Law tends to be the most favorable law to employees. Sexual harassment can be painful and upsetting. It may be a shock when it occurs in a fun and festive environment like an office holiday party. It can be complicated and time-consuming to file a sexual harassment complaint in New York City. It is important to find an experienced attorney to represent you. Call Phillips & Associates at (212) 248-7431 or contact us through our online form. We handle employment litigation in the Bronx, Queens, Brooklyn, Manhattan, and Nassau, Suffolk, and Westchester Counties, as well as Pennsylvania and New Jersey.